Most people think of the YMCA as a traditional workout center, a place for youth sports, and a provider gym and swim opportunities, but the Scenic Rivers YMCA is meeting their mission by providing so much more to the communities they serve. YMCA programs and offerings have changed and evolved over the years, but the mission of the Y has remained the same. The Y strives to put Christian principles into practice through programs that build healthy spirit, mind and body for all, in every program they offer. 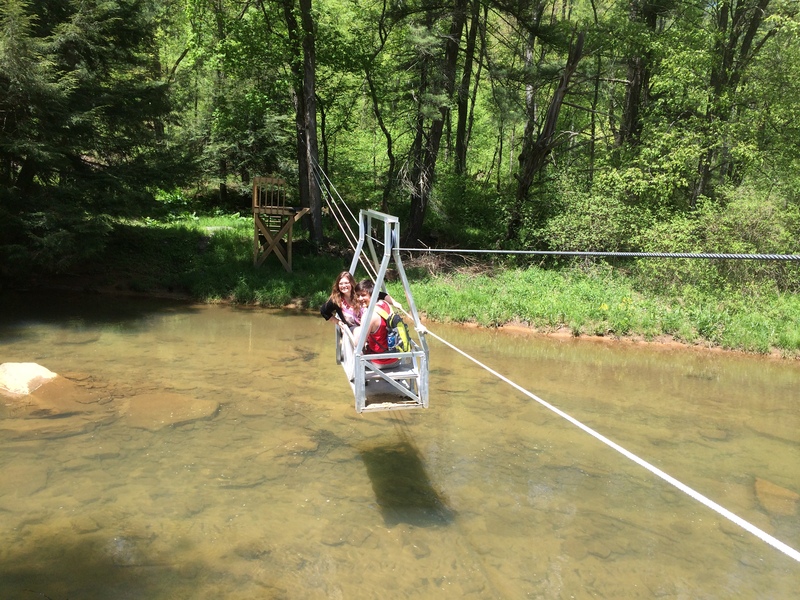 The Scenic Rivers YMCA, which includes the Oil City YMCA and Clarion County YMCA, purchased Camp Coffman in 2008 and have built new infrastructure and programming to meet community needs. The camp has become a popular attraction. 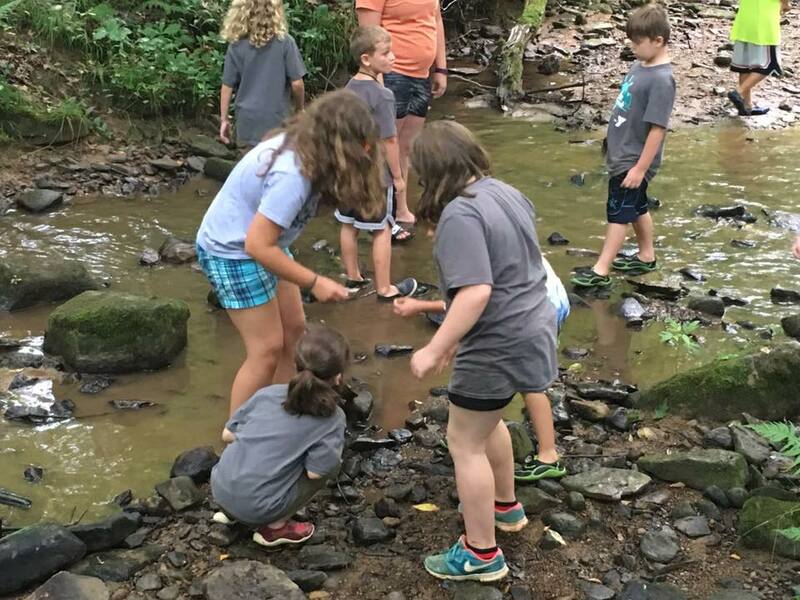 “The Y offers some non-traditional activities at Camp Coffman and that’s what I love about it,” said Tom Spence, CEO of the Scenic Rivers Association. Spence and volunteers have played key roles in completing multiple building projects at Camp Coffman, including a new two story “Treehouse” cabin that the organization began renting in late 2016 and a covered patio next to the banquet hall, completed last month. The Treehouse Cabin, which sleeps eight, is the brainchild of Spence. 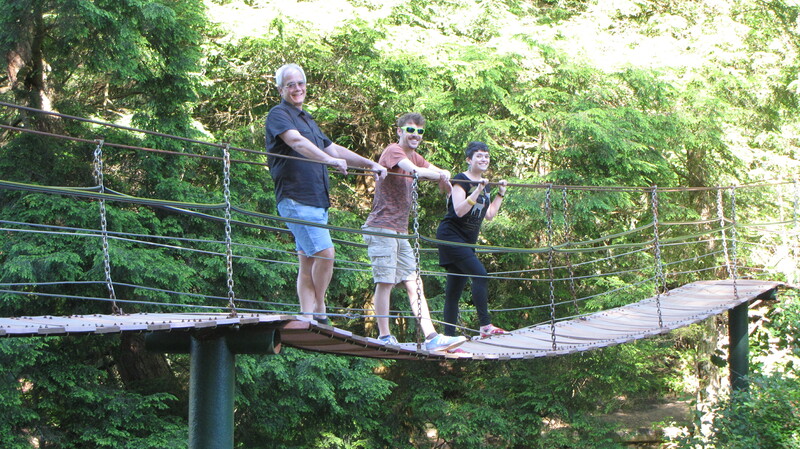 “I’m an avid watcher of Treehouse Masters and wanted to build a treehouse on camp property,” said Spence. While the cabin is not exactly built in the trees, it appears to be from the wall of windows inside. 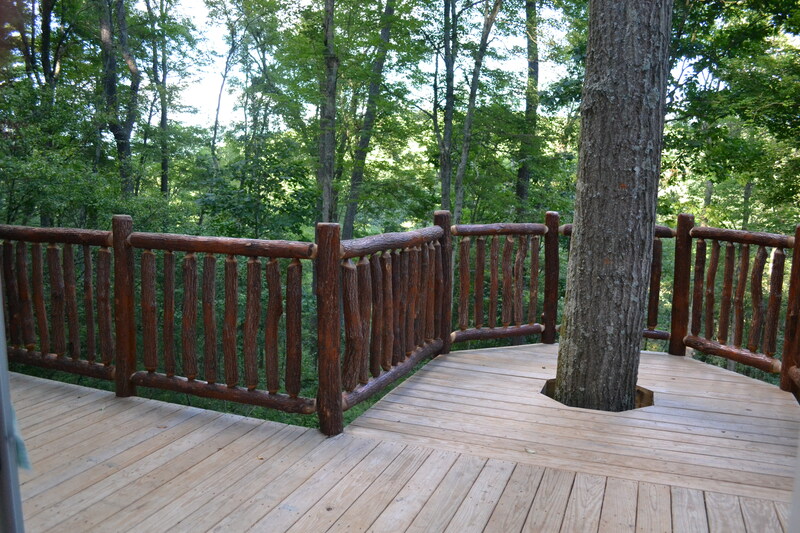 Venture out to the deck, which does wrap around a tree, and you’d think you were in an elevated treehouse. The Treehouse Cabin has some special features including a large deck, wood theme interior, loft with built-built in beds and nature themed furniture. Amenities include a private bedroom and full bathroom, full-kitchen, outdoor fire pit and a private setting. Weddings have been an unexpected, but welcome addition to the offerings at Camp Coffman. 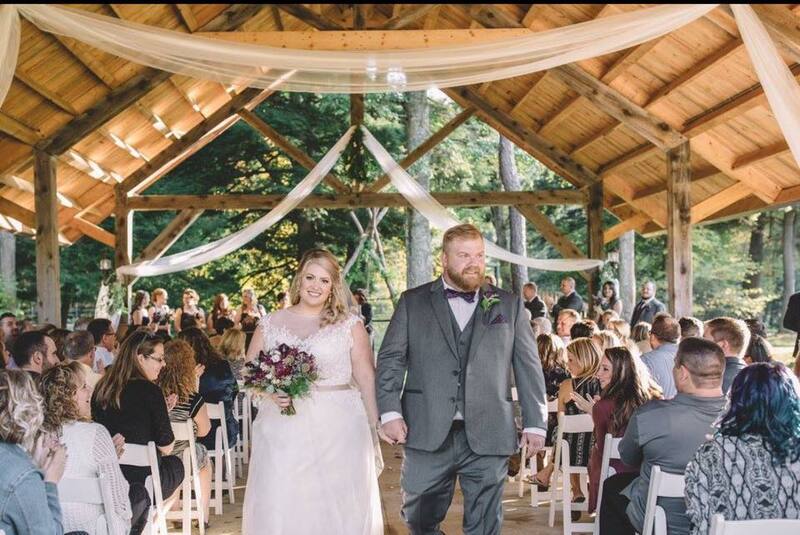 The number of weddings have continued to grow at Camp Coffman over the last several years. The camp has averaged 20 weddings a year but now expects that number to increase with the recent addition of heat in the banquet hall. Wedding parties can rent the full camp for $2550.00 which includes use of all the cabins, the banquet hall and the grounds from Friday through Sunday at noon. 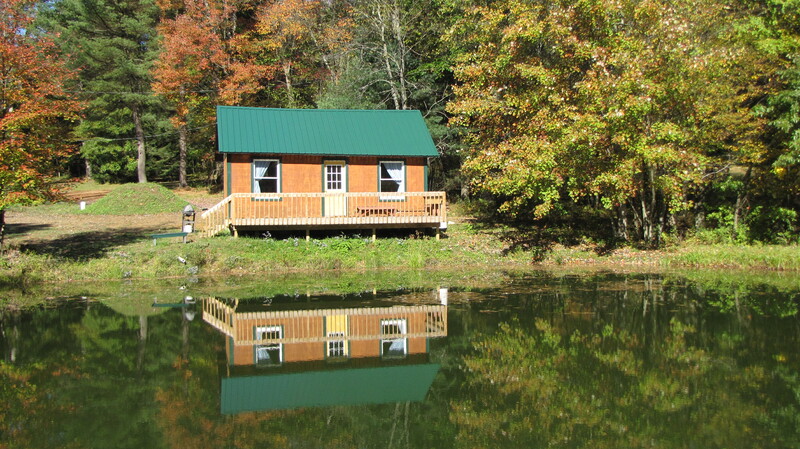 Cabin rentals are available year-round. Guests may choose from nine comfortable cabins at YMCA Camp Coffman to rent for a relaxing getaway. Two cabins, Iroquois and the Treehouse have private bathrooms. The other cabins have convenient outdoor toilets and a modern shower house close by. The Algonquin Lodge is the second largest cabin with a capacity of 14 guests. The Cayuga Bunkhouse sleeps up to 20 guests. Rentals begin at just $40 a night. 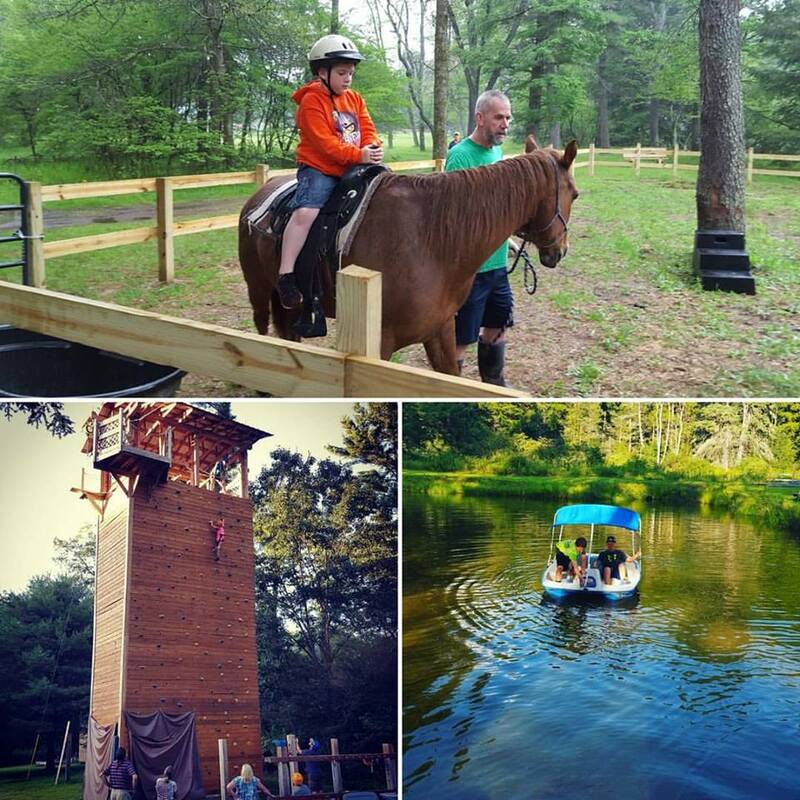 Popular activities at YMCA Camp Coffman include the zip line and climbing wall, horseback riding, paintball, fishing, boating, archery and hiking. Activities are available by advance reservation. Birthday parties with themes are now offered. A picnic pavilion provides a great outdoor space for parties, picnics, weddings and reunions. It can be rented separately or as part of a package. YMCA Summer Day Camp for ages 6-12 is held during the week at Camp Coffman. This year, an average of 80 kids have participated each week. Youth enjoy outdoor experiences and activities to build knowledge and stay physically active. Hiking, horseback riding, zip lining, exploring, climbing, canoeing, boating, fishing, games and organized crafts and activities are part of each weekly experience. Themes make the weeks fun and exciting. Summer Day Camp field trips are held for all YMCA Summer Day Camp participants on Fridays. The group has visited Waldameer, Pymatuning, Carnegie Museum, Seneca Lanes, Hasson Park, Asbury Woods, Hasson and Clarion pools and other locations. Camp Coffman was founded in 1923 by the late J.P. Coffman, a volunteer commissioner of the former Colonel Drake Boy Scout Council. Camp Coffman operated as a full scale boy scout camp until 1976 when financial trouble caused it to close. The 350 acre camp was sold in 1982 to a local business, with plans to selectively harvest the camp’s timber, while still allowing youth or community groups to use the grounds. Since then, the lease to the property bounced between church-related owners that kept the property open to the public, but were unable to maintain operations. 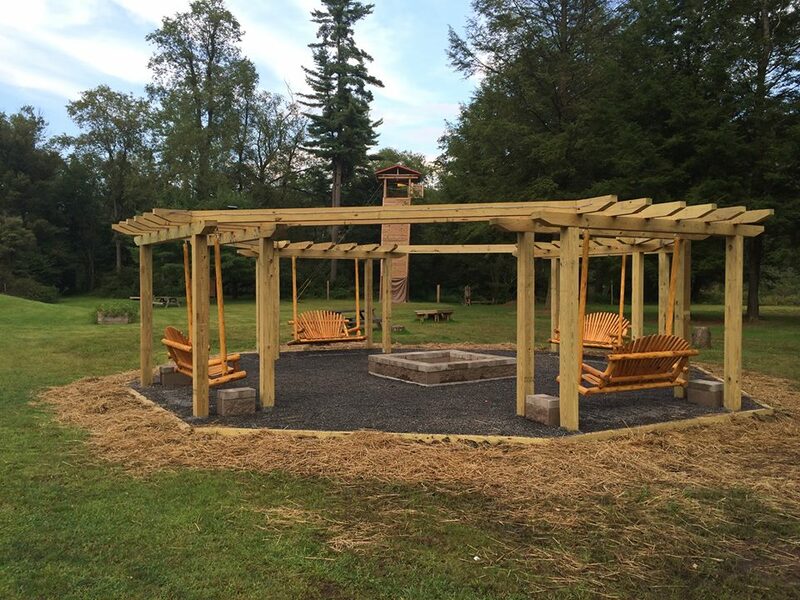 The Oil City Area YMCA (including the Clarion County branch) had used the grounds for their summer day camp in 2007, and has been in control of the property since the beginning of 2008. Today, the Oil City YMCA owns and operates the 240 acre YMCA Camp Coffman.